Open Hands and Dirty Feet: Hey, you're a gringa - teach us English! Thanks for following us! It’s hard to believe we’ve been here a year already. Contributing to the blog every now and again gives me the chance to reflect on where we were last July and where we are now. We’ve made some steps and progress in many of our programs, and today I’m going to talk about our growth in our Children’s English program. Contrary to the popular belief among many of the people we encounter down here, Manna Project International is NOT just an English-teaching organization. English is, however, in very high-demand. Many people see it as fundamental to professional success- be that in business, tourism, law, medicine, or many other career options. Therefore, we receive constant inquiries about our English classes. Although children almost unilaterally receive English instruction in school, many parents are eager to get their children supplementary lessons. Our being native speakers as well as our classes’ fair prices make Manna Project’s English program a desirable option. Since September, we have added a third class to accommodate greater enrollment as well as a wider range of ability. I teach the intermediate class, but we all follow a similar structure and set of teaching methods. Students are placed based on their score on a placement test. We keep our classes small- no more than 10-12 students- in order to ensure that each student has optimum opportunity to participate in each class. We follow the Let’s Go curriculum and complement the curriculum with games, activities, and exercises that build students’ writing, comprehension, and speaking abilities. Each student must score an 80% on the final exam in order to advance to the next level. The three instructors coordinate to make sure that each level starts off where the previous level finished. 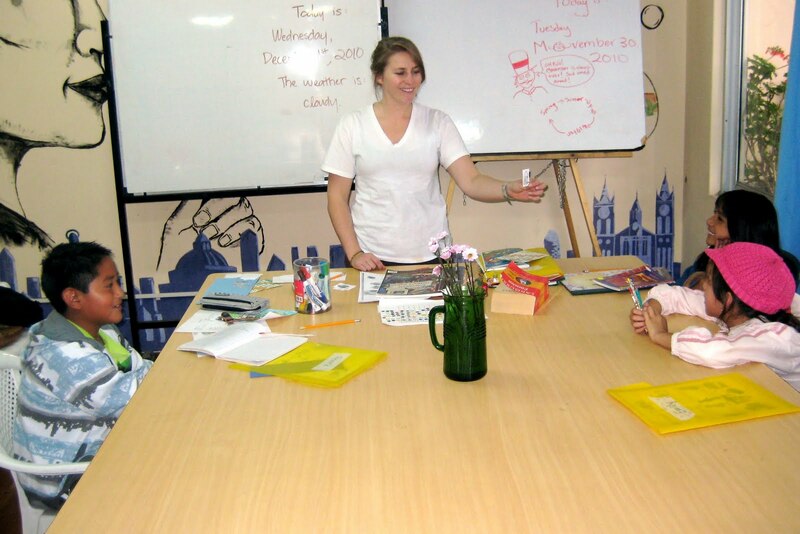 This creates a fluid and comprehensive English program. On a more personal note, teaching English has been one of my biggest challenges here. I used to sit in class as a young child and fantasize about what kind of teacher I would be. I would be “cool” and always nice. I would give no homework. Quizzes and tests would certainly be unnecessary. You can imagine my surprise when I found myself with a disciplinary system identical to that of my 4th grade teacher’s- a system of red, yellow, and green cards. The class starts out on green and cards are taken down whenever the class misbehaves, talking out of turn, looking at each other’s quizzes, or getting up and walking around the room. 10 classes on green amounts to some sort of prize. Getting all the way to red negates a “green day”. Even more surprising is that I give weekly homework and quizzes. What I didn’t understand as a young student was that my teachers probably did all of these things out of a genuine desire to see their students understand and master the material put in front of them. At least that’s why I do it. It also turns out that English is extremely difficult. Learning Spanish was a piece of cake compared to what these kids face. We break rules, arbitrarily assign prepositions to different words, and randomly designate letters silent in certain words. For every frustrating moment I have, I am equally impressed by these 7 year olds’ ability to understand such a challenging language. English really is one of our strongest programs, and we are a resource for the community- providing a skill for them that they see as vital. When I look at it that way, the work and frustration is more than worth it and I’m proud to have been part of this program for the past year!